Once in the tubes, it’s a quick dash for the burritos across San Francisco Bay. Propelled by powerful bursts of compressed air, the burritos speed along the same tunnel as the BART commuter train, whose passengers remain oblivious to the hundreds of delicious cylinders whizzing along overhead. Within twelve minutes, even the remotest burrito has arrived at its final destination, the Alameda Transfer Station, where it will be prepared for its transcontinental journey. Ever since Isaac Newton first described the laws of gravity in 1687, scientists have known that the quickest route between two points is along a straight line through the Earth’s interior. 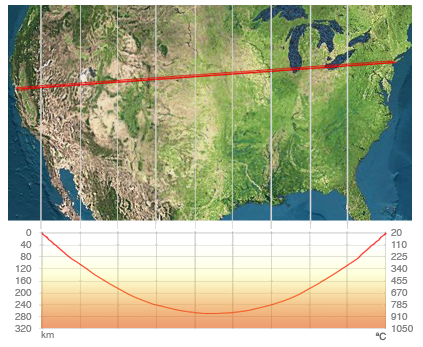 Through the magic of gravity, any object dropped into such a “chord tunnel” at one end will emerge exactly 42 minutes later at the other end, no matter the distance. But for hundreds of years, the technical challenges of building such a tunnel were so daunting that it remained a theoretical curiosity. Only at the start of the 20th century did the idea become technically feasible, and to this day the tunnel linking the East Bay with New Jersey remains the only structure of its kind in the world. From the outside, the Alameda facility looks like any other industrial building. Behind a chain link razor wire fence sits a windowless white hangar some three stories tall, surrounded by a strip of green lawn. If you could see underground, however, you’d see that the building sits at the center of a converging nexus of burrito pipes. 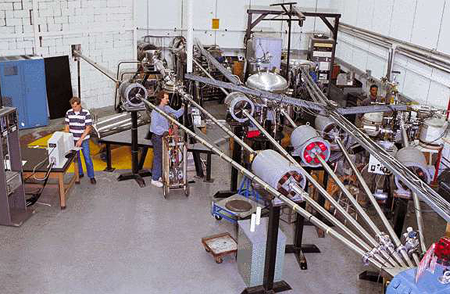 High pressure pneumatic tubes from all over the Bay Area emerge in the center of the facility, spilling silvery burritos onto a high-speed sorting line. The metal-jacketed burritos look like oversize bullets, and the conveyor belts that move them through the facility resemble giant belts of delicious ammunition. Within a few seconds of arrival the burritos have been bar coded, checked for balance and round on a precision lathe, and then flash-frozen with liquid nitrogen. The mouth of the tunnel is a small concrete arch in the side of a nearby hill, about as glamorous as an abandoned railway tunnel. Yet if you could open the airlocks and stare down its length with a telescope, you would see airplanes on final approach to Newark Airport, three thousand miles away! 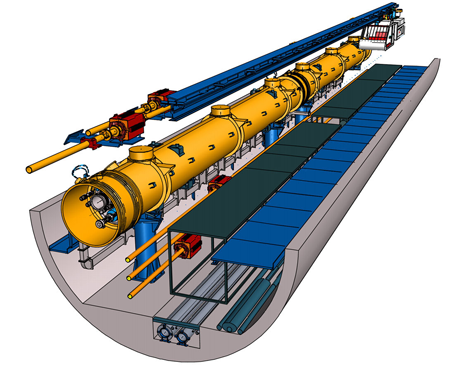 To reduce drag on the burritos to a minimum, the tunnel must be kept in near-vacuum with powerful pumps. At the tunnel’s deepest point the burritos will be traveling nearly two kilometers a second - even the faintest whiff of air would quickly drag them to a stop. The launch tube for the burritos lies just under the tunnel mouth and looks like what it is: an enormous gun. Every four seconds a ‘slug’ of ten burritos, white with frost, ratchets into the breech. A moment later it flies into the tunnel with a loud hiss of compressed gas, and the lights dim briefly as banks of powerful electromagnets accelerate the burritos to over two hundred miles an hour. By the time they pass Stockton three minutes later the burritos will be traveling faster than the Concorde, floating on an invisible magnetic cushion as they plunge into the lithosphere. No one who built the Alameda-Weehawken tunnel had quite this future in mind for it. The tunnel had its origins in the early 1900’s as an ambitious project for speeding mail delivery between New York City and the booming Pacific port of San Francisco. The telegraph and railroad had linked the city to the East Coast, but transferring documents, currency, securities and diplomatic correspondence across the country was still a slow affair fraught with danger. In 1911, the celebrated British civil engineer Basil Mott approached the plutocrat Andrew W. Mellon with an audacious plan to build a straight-line tunnel 2500 miles long connecting New York City with San Francisco, allowing packages to be sent between the two cities using only compressed air and gravity. The tunnel would resemble the pneumatic tube systems that had served New York City and Paris so well for mail delivery, but on an incomparably vaster scale. Cylinders containing up to sixteen pounds of mail would be able to make the continental transit in less than an hour. Construction on the tunnel began in 1913, and it quickly grew into the largest public works project in the young nation’s history. Not until the Eisenhower Interstate system in the 1950’s would there be a bigger or more costly civil engineering project. Drilling the tunnel required over 19 years of continuous effort by thousands of miners, often working in conditions of intolerable confinement and heat. Over 22 million tons of rock had to be removed, much of it from unprecedented depths, all while keeping the tunnel perfectly straight over thousands of miles. Just keeping the tunnels cool required more water each day than flows over Niagara Falls. The tunnel opened to great fanfare in 1933, with a congratulatory message in Morse Code flashed by powerful searchlight from the San Francisco end to waiting dignitaries on the New Jersey side. It was already obsolete. The first regular mail shipments sent from San Francisco in the spring of 1934 had to compete with the sophisticated air mail system that had grown up during the tunnel’s long construction. To make matters worse, breakdowns in the tunnel were frequent, especially in the central “hot zone” where temperatures could exceed 900 degrees Centigrade. Mail would frequently arrive singed or deformed from the intense heat and pressure. While they could never beat the speed of the tunnel, airplanes could deliver documents at far lower price and risk in just a few dozen hours more. 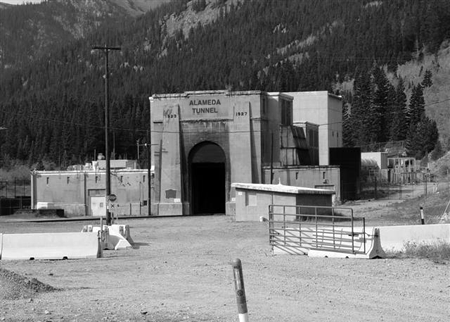 In 1936, at the height of the Depression, the tunnel ceased operation less than three years after it had opened. In the years to come all kinds of schemes would be floated for how to put the tunnel to use. For a brief time after Pearl Harbor there was serious thought given to using it as an enormous gun barrel that could fire artillery shells across the Pacific at Japan (the risk to life in San Francisco if a charge went off prematurely was deemed too great). In the early days of the Cold War, both ends of the tunnel, along with the Chicago and Cedar Rapids access shafts, were considered as enormous fallout shelters. The low point in the tunnel’s fortunes came with a 1971 proposal (mercifully never enacted) to use the Weehawken side of the tunnel as the world’s deepest garbage chute. On the San Francisco end, meanwhile, squatters from the thriving San Francisco countercultural scene had begun using the tunnel as an easy place to take shelter. By the early 1970’s the tunnel was a derelict, a mostly forgotten relic of a more adventurous time. The turning point came when Robert Cavanaugh, a New York financier with a serious taste for Mexican food, happened to come across a mention of the tunnel in a zoning proposal. The globetrotting Cavanaugh was a fanatic of the recently-invented Mission burrito but bemoaned being unable to get it anywhere outside of San Francisco. Examining blueprints of the defunct mail tunnel on a flight home to New York, Cavanaugh became intrigued by the coincidence in size between a foil-wrapped burrito and the diameter of the old transcontinental mail tubes. By the time the plane landed, he had come up with an audacious plan. Cavanaugh realized that the intense heat of the transit that had so beleaguered mail service would actually work to his advantage in a burrito tunnel. The burritos could be stored frozen on the Western end and arrive fully heated through in New Jersey. Furthermore, advances in electrical engineering meant that containers would no longer have to be propelled by compressed gas. The burritos already came conveniently wrapped in aluminum foil - it would be trivial to accelerate them with powerful magnets. Encouraged by his back-of-the-envelope calculations, Cavanaugh formed a consortium and, in a stroke of genius, convinced the Carter Administration to subsidize the tunnel’s operation in exchange for access to the geothermal heat it would produce. Convincing skeptical businessmen to buy into the plan proved more of a challenge - it took six months to persuade suspicious taqueria owners to switch to a salsa with lower magnetic permittivity. Finally, in July of 1979, all the pieces were in place. After a successful July 2 dry run with a sawdust mock burrito, the tunnel ceremoniously opened on Independence Day. The inaugural burrito (carnitas with lettuce, salsa and avocado, no beans) was loaded into the breech at the Alameda terminus at 10:05 AM and was served to a beaming Cavanaugh, Vice President Walter Mondale and New York mayor Ed Koch in Weehawken 64 minutes later. Two hundred burritos followed that same day; by the end of the decade the tunnel would be delivering over two thousand burritos an hour. The greatest risks to the tunnel, however, are likely to come from Mother Nature herself. During the 1989 Loma Prieta quake the tube misaligned by over four inches, requiring extensive redrilling, and experts estimate that an earthquake of magnitude 6 or greater on the Hayward Fault could put it out of commission for months. An ambitious expansion plan to begin next year will address some of the seismic hazards while also widening it enough to allow super burritos to make the transit for the first time ever. Burritos speeding through the tunnel fight a constant battle against friction. At the start and end of their journey they hover in a powerful magnetic field, seldom touching the sides of the tunnel. Past the Colorado border, however, the temperature of the surrounding rock exceeds the Curie point of iron and the burritos must slide on their bellies in their nearly frictionless Teflon sleeve, kept from charring by pork fat that slowly seeps out of the burritos as they thaw. By the time the burritos reach Cedar Rapids (traveling well over a mile a second) they are heated through, and anyone who managed to penetrate into the tunnel through the Cleveland access shafts would find them ready to eat. Of course, it would be best if the tunnel could give back in a more tangible way. Over the years there have been numerous attempts to send New York staples in the reverse direction - operators have tried sending knishes, bagels, pickles and even Brooklyn-style pizza. None have proven as resilient as the humble burrito, and in the end the two cities have bowed to the inevitable. Both tunnel tubes now carry only burritos. By the time they reach Cleveland the burritos are fully heated through and traveling uphill at about twice the speed of sound. A series of induction coils spaced through central Pennsylvania repeats the magnetic process in reverse, draining momentum from the burritos and turning it into electrical power (though Weehawken residents still recall the great blackout of 2002, when computers running the braking coils shut down and for four hours burritos traced graceful arcs into the East River, glowing like faint red sparks in the night). At the tunnel exit, a final puff of air slows the burritos to a stop and they are placed in insulated bags. These are whisked to a fleet of waiting trucks, which pass through the Holland Tunnel (this time at a more stately thirty-five miles per hour) and then onward to restaurants and cafeterias throughout the five boroughs.